For Lower Moreland Registered Votes who will not be in the township on November 7th, you should not miss your opportunity to vote. The deadline for registering to cast an Absentee Ballot is October 30th and the deadline for the State to receive your vote is November 3rd. It’s easy, and there is no cost…and you can do it right now if you have just a few minutes. 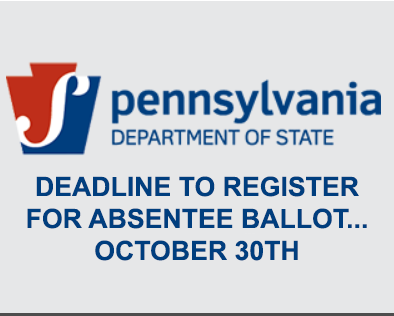 Click on over to the PA Online Voter Registration Web site and follow the easy-to-do instructions. But do it now. We value every single vote, so please take this opportunity to make sure your vote is counted…even if you cannot be home with us on November 7th.